Blog. — The Style Formula. Skin Care Update: The Power of the Professionals. Designer bags, shoes and beauty treatments – why a professional beautician is also a worthy “wardrobe” investment. With the addition of Valentina to our family plus a VERY busy work year ahead, my skin care regime has drastically changed in the last nine months. I no longer have the time to prep/ scrub/ apply countless serums like I once did, and don’t even get me started on my make up regime – I have a 15 minute window where my kids will occupy themselves and that’s the extent of “me” time. 2019 has therefore been the year of investing in professional treatments, which allow me to maximise my time to ensure I am looking and feeling my best every day. A few hours a month spent getting a facial or treatment (lash lifts and brow tints for the win – no need for mascara or brow touch ups every day!) mean I cut my morning beauty routine and manage to leave the house on time. Finding the right salon and beautician was very important to me – I wanted someone close, trusted and luxurious (hey, if I’m paying for a professional service, I want to feel pampered and relaxed!). I needed my beauty team to be across all latest technologies and treatments, yet know the difference between a fad and genuine offerings. I wanted someone who was at the top of their game and producing incredible results. Most importantly, I wanted someone who was just as passionate about good skin care starting from the inside, where treatments served to enhance natural features, not completely change them. Artisan Clinic ticked all of those boxes for me. With a salon along Racecourse Road, Ascot (and three more located in Fortitude Valley, Newstead and Paddington), Artisan Clinic is a one-stop-beauty-shop offering everything from facials and cosmetic injectables through to body sculpting (they have a procedure called the “Double Chin Treatment”, WHO KNEW!? ), skin tightening and laser treatments. If you’re feeling self conscious about it, there’s a good chance Artisan Clinic can do something about it! Despite their extensive treatment list, I was firm on what I wanted and needed from them: I wanted a treatment with zero downtime but instant results. I wanted to look fresh, dewy and glowing and I didn’t want to spend an obscene amount of time or money. With all of this in mind, I was told the DMK Enzyme Therapy Facial was for me. Time: 105 minutes (a little longer than I wanted but I was assured the results were worth it. Plus I figured I could fit a nap in #multitasking). The DMK facial is designed to restore skin to its’ peak condition, which all sounded well and good… but when I was ALSO told that the latest viral image of Kim and Kourtney Kardashian getting weird looking facials was a similar (if not the exact same) treatment, I was sold. If it’s good enough for Kimmy K, it’s good enough for me! Starting with a skin analysis where my lovely beautician inspected and diagnosed my skin, I was treated to a delicious facial where my skin was cleansed and prepped for a quick peel. For those who haven’t had a peel before (this was my first time), your skin will feel VERY hot but only for a minute or so until the sensation begins to die down. I’m told the “healthier” the skin, the less heat you feel. Don’t stress, the heat is a pseudo heat – not the skin actually burning! This process is integral to your “glow” as it removes dead skin cells and build up, leaving the skin instantly radiant and luminous. Once the peel is complete the enzyme facial can begin. The enzyme substance is pasted onto the face and feels like any other mask you might otherwise use. The beauty (and crazy) part of the enzyme facial is the reaction that occurs over the next 40 minutes, where the mixture hardens to a cement consistency. Your skin will feel very tight and taut – to the point where you will think something has gone wrong! Don’t stress, this is ALL part of the treatment. A quick wipe of a wet cloth and the facial is done and dusted and your skin is back to normal… but 1000x BETTER! I couldn’t believe the instant results. I’ve had facials before and there is always a slight glow but this was something I’ve never experienced before. My skin was bright, even and incredibly smooth. This lasted for a good 3-4 weeks. The DMK Facial was exactly what this busy Mumma needed: an instant glow that would make me look like I am eating right, exercising regularly and sleeping 8 hours a night. WINNING! 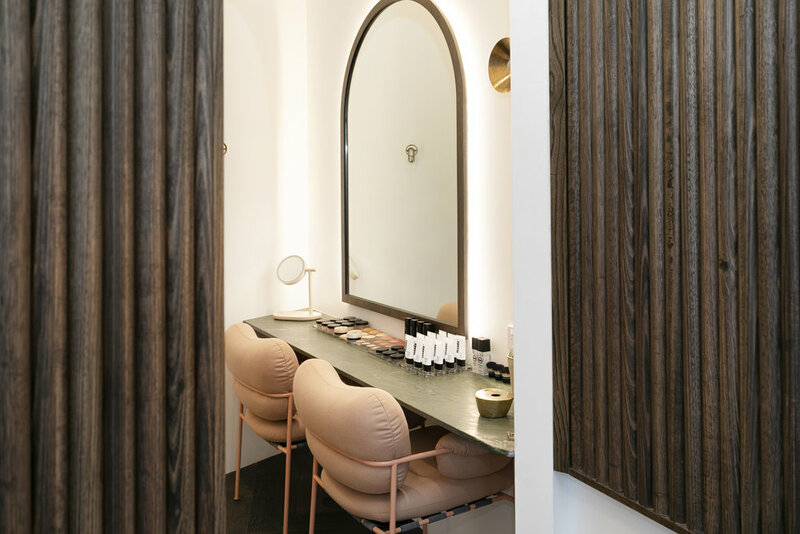 Not only was the treatment a dream, the salon is #interiorgoals with marble tables, linen curtains, pale pink stone accents, gold furnishings and deep wood walls. I am literally bringing my husband along to my next treatment so he can see how I want our next house designed! The salon is the ultimate “luxury escape” from the minute you walk in to the minute you leave. 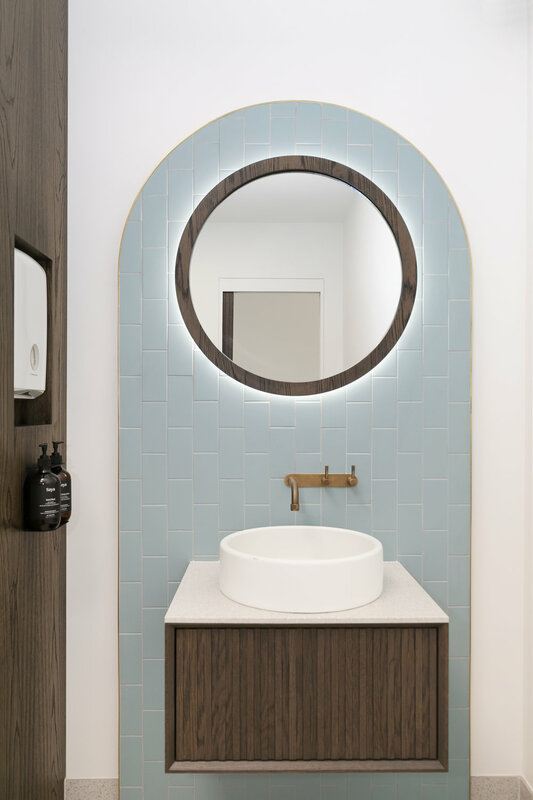 Despite the state-of-the-art treatments, beautiful furnishings and tailored beauty programs, the absolute best part about Artisan Clinic is the staff who go above and beyond to ensure your stay is perfect. Not only are they the best within the beauty field, they also offer REAL advice where the goal is to find the right treatment for you and not just put money through the till. With two small children and approximately 45 freelance jobs on the go, investing into Artisan Clinic was a necessary move to get me out the door and looking “put together” when I feel anything but. Just like a Chanel bag or pair of Gucci sneakers, sometimes a luxe facial is all it takes to dress up an old outfit…. Or tired eyes! Skin Needling: What, Where, Why & How. For those who have been following my skin journey, you know there isn’t a product, brand or treatment I haven’t tested or looked into. It may have taken 12 months, but I have managed to curate the perfect beauty regime for me and my skin, and am finally confident enough to leave the house with very minimal coverage (I ran out of foundation about a month ago and don’t feel the need to replace it). My skin not only looks healthy; it feels healthy where breakouts, dark circles, pigmentation and broken capillaries are all issues I no longer deal with… or, at the very least, know how to deal with swiftly. Despite my clear complexion, I was still battling fine lines and wrinkles, which are clearly going to require more than Vitamin C serum and Retinol to completely fade. A quick Google-search on “how to reduce wrinkles” and Skin Needling is a procedure that will continuously pop up. A treatment designed to trick the skin into thinking it has been “injured”, micro needles enter the skin surface in order to stimulate growth factors and generate collagen and elastin. Please note this is a very nice way of putting it! Basically we are injecting your face with hundreds of needles… but it’s worth it I promise! Skin Needling seems to be everywhere at the moment with the likes of Kourtney K ‘gramming during her procedure as well as the entire New York Fashion Week crowd flocking to the famous Dr Barbara Sturm for their Skin Needling treatments. I decided that if it’s good enough for a youth-obsessed Kardashian, it’s good enough for me! A new (and very trendy) clinic situated in Teneriffe, Beauty Boost is run and owned by the beautiful Samara Searle whose views on “natural” beauty won me over. While she may run a business based around fillers, Botox and Skin Needling, her aim is to enhance rather than exaggerate. Growing up, Samara was exposed to the Beauty Industry via her Mother (a Beauty Therapist), and the Medical Industry via her Father (a Doctor) and has successfully merged the two to create a professional and productive business that offers the very best in anti-aging treatments. At the very core of her beliefs, Samara is all about aging gracefully where preventative measures provide more confidence than expensive, heavy make up. After this discussion, an initial skin consultation and review, I decided this was the clinic and procedure for me. I arrived in the afternoon fresh faced and VERY nervous for what was to come. Samara was so lovely and calm and did a good job of putting me at ease. She cleaned my skin before applying the numbing cream and talked me through her personal skin regime and experiences (see below, she has some GREAT tips!). After about 15 minutes we decided it was time to start the treatment. My main concern is my forehead where the wrinkles are more pronounced. The skin is also thicker in this area so it is usually necessary to go a little deeper. In terms of pain, I would describe the procedure as uncomfortable but not painful. Kind of like going to the Dentist – you don’t feel anything but the noise and sensation can be off-putting. I did have a few people message me on Instagram to let me know they had tried Skin Needling and found it slightly painful. They had also gone back for second and third rounds though as they believed the benefits outweighed the procedural matters. Samara worked efficiently and gently and made sure to check in every few minutes or give me a break if necessary (I did request a few breathers!). After 20 minutes, the procedure was complete, the hyaluronic acid was applied, and I was ready to go home and await the results. Be warned, your skin will look very red post Skin Needling with some areas darker than others, giving a “scratched” or “bruised” look. I was told the feeling would mimic that of sunburn and my skin felt warm, tight and tingled for about 12 hours post-treatment. The suggested downtime is 24-48hrs however I definitely took longer to heal. For those who are considering this procedure in line with a special event, DEFINITELY give yourself a week to heal and see positive results. While my skin looked somewhat normal within 2 days, I couldn’t apply make up for approximately 4-5 days due to the peeling (very minimal and only came about when I tried to apply bronzer). For the next few days I completely stripped back my beauty regime and used gentle cleansers and applied rich moisturises. The needling opens up the dermis and I was careful not to expose it to harsh chemicals or make up. I also made sure I drank plenty of water to ensure I was hydrating from the inside out. My skin is noticeably plump and firm and the fine lines on my face are definitely softer. For the first time in a long time, my skin feels fresh, clean and completely clear and I attribute this all to the Skin Needling procedure. I would highly recommend this treatment for those who are wanting to look and feel their best for a special event. For those wanting longer lasting results, you will need to invest in at least 3 sessions (about 4-6 weeks apart). While the downtime can require some patience (and an oversized pair of shades), the noticeable effects are worth it and I can only imagine how gorgeous your skin would look with consistent treatments. With my fresh new face I only wish I had a fabulous event to attend – Oscar and Valentina don’t seem to appreciate Mummy’s new skin as much as she does! I use the Aspect Dr range: an Australian owned clinical grade skin care range. I stock this in the Beauty Boost clinic and use it myself due to its exceptional anti ageing qualities with no toxic or harmful ingredients. Morning: Deep clean cleanser + Vitamin B serum + Vitamin C serum + eye lift resveratrol cream + SPF 50+ sunscreen. Night: Deep clean cleanser + Vitamin A (every second night) + exfoliant (alternate nights with Vitamin A) + eye lift resveratrol cream.